Description: This hinged cuff bracelet takes the Grecian cuff design and reinvents it with the refinement of fine couture vintage jewelry. 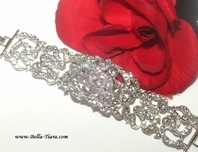 Hundreds of delicate crystals painstakingly set in faux platinum, clean fresh lines with simple scrolls and "Voila", a perfect couture cuff bracelet for any special event! 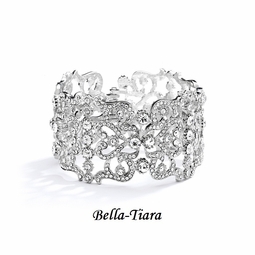 Our 8" hinged bejeweled cuff bracelet is 1 1/2" w & has fiery Crystals in a faux platinum finish.